My apologies! The Day 3 video tutorial is a little late but trust me I have an awesome excuse. We had an especially crazy day today on the farm! Around 7:30am my husband wakes me to tell me Emma had her baby. He saw a calf in the field while doing the morning farm chores. Half asleep I jump up and throw some clothes on and run out and check on them and what a beautiful surprise! Emma had mostly already dried off the baby and I peeked around her back side and see that it’s a heifer calf. Jackpot! But that wasn’t the most shocking part. 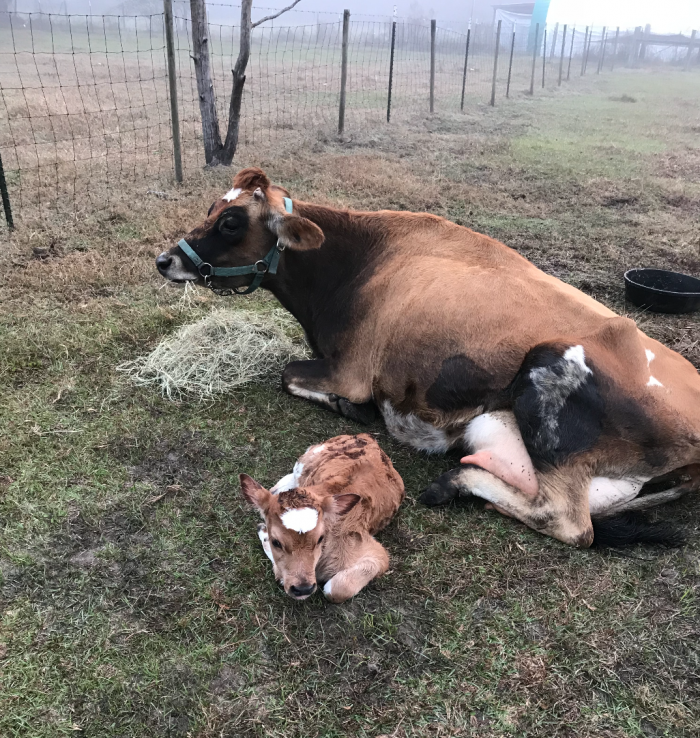 You can imagine my face when I look and see a calf that looks PURE Jersey like her momma. Definitely not the Black Angus baby I was expecting since she was supposed to have been bred to a friend’s Black Angus bull. 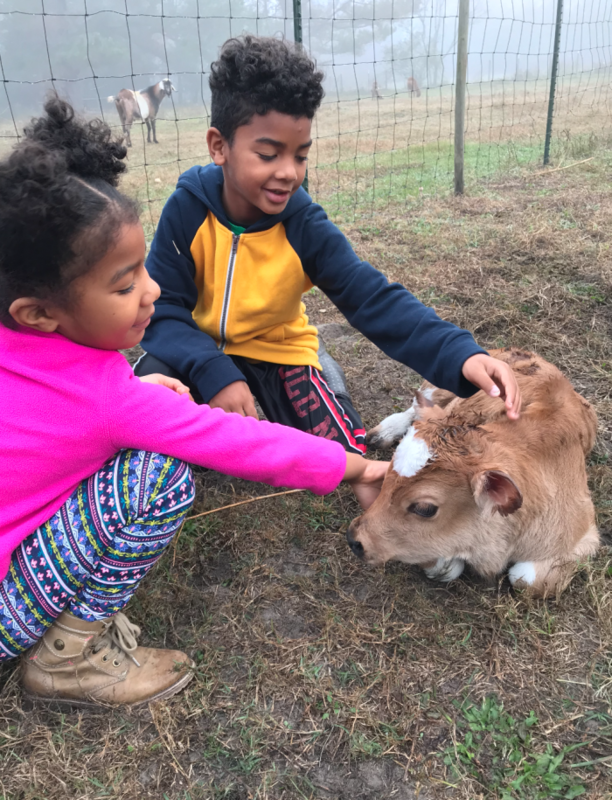 After a couple calls we checked calendars and dates and it turns out she must have been bred by a previous owner’s mini-Jersey bull before the friend’s we bought her from got her because she was one full cycle early. Phew! What a morning!! So we ended up with another future milk cow. Lucky us! Emma is doing good, baby is nursing like a champ and I’ve been giving momma some chamomile tea with molasses to help reduce edema. I’m about to be swimming in Jersey milk, y’all. We plan to share the milk with the baby calf so she’ll get all she needs and she’ll also get to be with her momma. I had to fight my kids to name her but I finally got my way and named her Claribel. 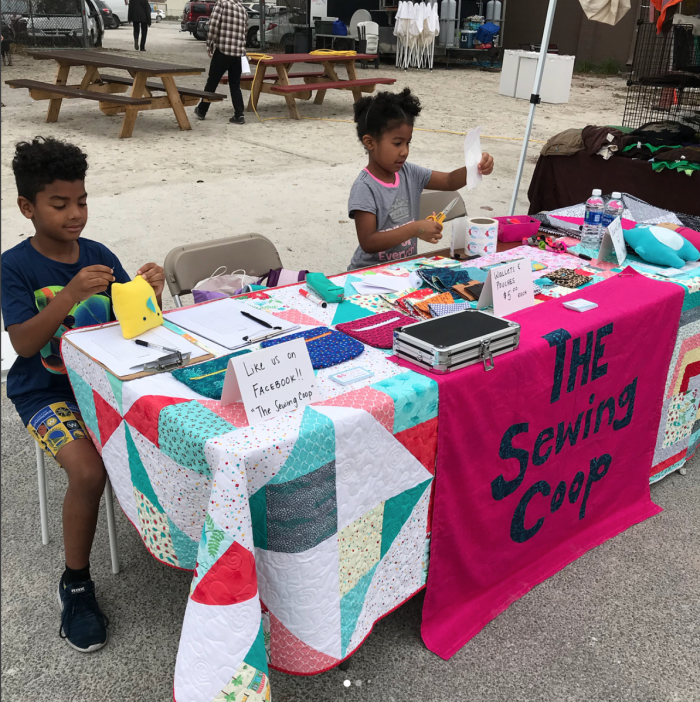 After I made sure they were all situated and fed the kids and I went to work our booth at a local craft show and were there all day with friends. 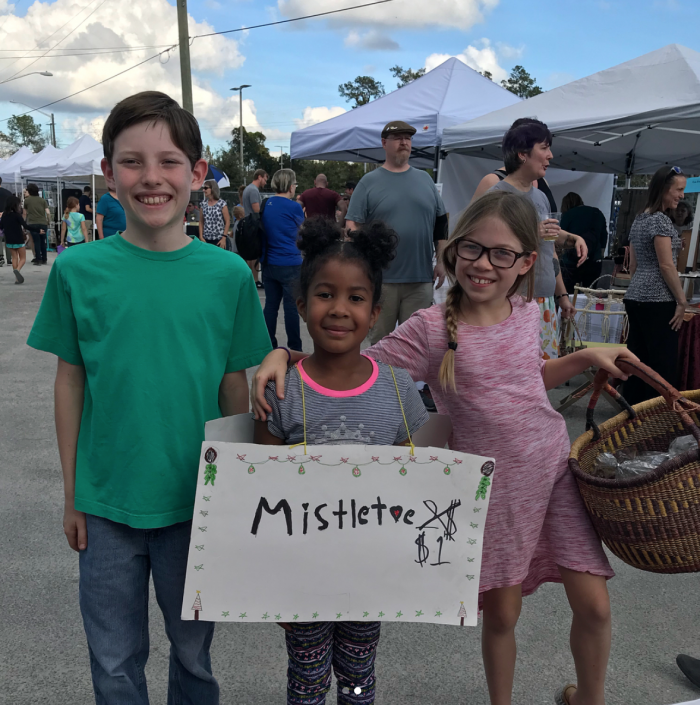 My kids sold some of their handmade wares and helped friends sell mistletoe they harvested from their farm. Needless to say these cute, smart and entrepreneurial kids sold out of everything! They all went home with a chunky wad of cash. So proud of them! We spent the rest of the evening with the cows and well, the tutorial is a little late. But here it is and it’s a good one! 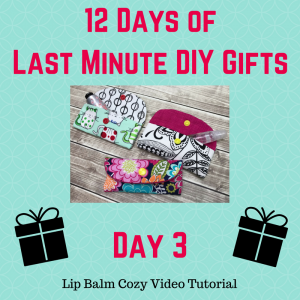 Click on the image above or right here to head over and watch the Day 3 of 12 tutorial featuring a Lip Balm Cozy! You are Terrific Vanessa ! Love this one ! 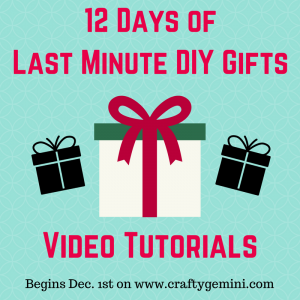 Another great last minute gift. Thanks so much. Congrats on your new addition to the family. Love seeing the kids with the calf and selling their wares. So easy! I make little bags or bigger with in-r-form plus to carry cell phones or sunglasses!!! I also make crossbody bags and they are great for phones, bank cards hand free for shopping! Your little bags perfect for doggy treats, lipstick, even jewelry you want to take off if you are out for a hike, forgot to take your nice earrings and rings off so you don’t lose them, keep it tucked away until you get home! Even roll up some cash if meeting friends for coffee and you don’t want to carry your Coach bag! Cute bags to make for girlfriends for the holiday fill it with a gift card! How about if you put bandaids in them along with a smalll tube of antibiotic ointment….going to make some of these for sure! I love it! I made one right away only a little bigger. These are great!! I’m planning to make this and the other two projects for my daughters’ basketball team and athletic trainers group. I was also looking at creating something else for my students at school. Thank you for doing these. As always the tutorials are awesome. If I can find a craft fair soon, I think I’ll whip some up for that too. I’m so happy you are able to let baby nurse and still have enough for your family???? Thank you for giving us so many last minute Christmas ideas! I enlarged them to 6” X 9” because I wanted to put hand lotion in them. I changed first fold to 2 1/4”. Love how they turned out. I need to make boutique items for my guild, and these ar so fast and really cute. I ordered snaps. So much easier than Velcro.